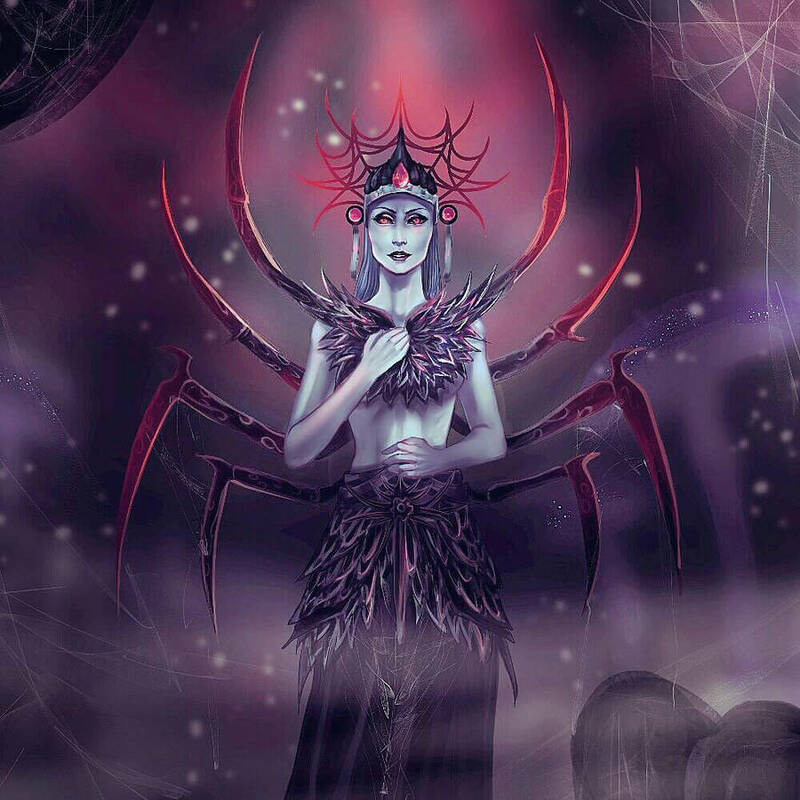 Cruel Mephala peered between the strands of her great web for mortals to toy with. Her luscious lips curved as she spotted her latest prey. A great rain had fallen over the Great Forest of Cyrodiil for the past three days, as if the Gods were in a great period of mourning over the land. Amidst the rain and unknown to prying eyes, a portal opened outside of Fort Coldcorn. The Nord Vikarn – He was tall, clumsy, and a tad oafish looking in the ebony armor. But his eyes sparkled like freshly fallen snow and merriment cracked the features of his face as he faltered with the assorted weapons in his arms before dropping onto the ground. The Khajiit Raj’ir – He was adorned with loose chains of gold and dangling jewelry. Coins and gems seemed to spill out of his pockets as he rolled into the wet grass. He cursed in his tongue as he fought to keep all the precious loot on his person. The Dunmer Azaron – the smallest of the bunch landed far easier when compared to the other two. He couldn’t help but grin at the number of scrolls and tomes he had managed to keep in his leather bags. A chuckle escaped his lips as he helped his comrades to their feet. The three of them looked at each other in their rain-soaked forms before joining Azaron in a merry laugh. For despite the odds against them, they had braved Clavicus’s realm and looted his most guarded facility of numerous treasures. Knowing it would be folly to strut into Bruma or the Imperial City with such incongruous amounts of valuables, they agreed to take refuge in Fort Coldcorn until Vikarn’s fence in the Thieves Guild would arrive in the morning. The rain-pounded fort itself had not been occupied by a living soul since the massacre that took place months before. No sensible individual would disturb the three surrounding the fire inside the structure, save for the old man who pleasantly watched them from afar. “To our fathers,” belched the Nord, “Who did not live to see their quest fulfilled in their time.” His companions incoherently concurred, and they raised their bottles in the air. Tired and drunk with glory and mead, the three fell to the lull of the warm campfire. Unbeknownst to them, a lone Spiderkith emerged from the shadows of the fort and gazed upon the three. Its eyes calmly swept over the sleeping three and their treasures, the latter of which held no personal value to the Daedroth. As quiet as a spider, the entity picked up trinkets and random from each traveler and placed them amongst the others. Then it calmly placed a sword in the arms of Vikarn, careful as to not disturb the brute. Satisfied, it stepped sideways back to its realm. The old man, not missing any of this, beckoned forth the Spikerkith’s master – Mephala – and asked for the Webspinner’s ear. The Prince of Secrets knew this old man to be the aspect of Sheogorath, the Prince of Madness. Mephala let out a sultry noise of disgust. “Leave me with my toils, Mad Prince. There is much I have to savor and endeavor; I have no room for silly games.” But Sheogorath smiled. A low hiss escaped Mephala’s luscious lips, “You would raise a finger against me?” But Sheogorath cackled as he sat beneath the tree. Undeterred, the Prince watched with bated breath. Her planning could not go astray from here, for it had been planned since she arranged their father’s deaths. At any moment, Raj’ir would awaken to see the Dunmer with a few of his trinkets. All she had to do was whisper in the Khajiit’s ear. Scorned, the drunken Raj’ir would grate the Elf’s face before reclaiming his prize. The Nord, stupid and confused, shall rise at the moment the striking occurred. Then he shall take the sword in his hand and sink it into the Khajiit’s chest, ending his life. The Dunmer will hardly have time to react before he finds his face scarred, his friend dead, and the Nord holding the bloodied blade. The Dunmer will take his leave and treasures and forge a bitter enmity with an equally rich Nord. Mephala’s attention was briefly diverted by the sudden smile of the Mad Prince and she cast dark thoughts in his direction. Then it dawned that her opportunity had come and gone. Unknown to all but Sheogorath, the excess rain had seeped through the ceiling and began to pour on the Khajiit, who woke in a startled fright. Beside him, the Dunmer had been disturbed by the sudden outburst and knocked loose one of the scrolls that rolled beside the Nord. Vikarn, illiterate and inebriated, did not understand neither the writing on the scroll nor comprehending the half-awake Azaron. He opened the scroll and frowned at the imagery before the runes lit bright and summoned fireballs from its very parchment. Between the relentless rain and the sudden explosion, Fort Coldcorn could no longer stand as a building and collapsed upon the travelers, burying them and the treasure. Mephala watched with distant eyes and looked over to the triumphant Sheogorath. The Mad God had vanished, leaving nothing but the echo of a laugh.